Charlie, sleeping on my stomach while I lay on the couch. One of my best friends over the years, Fuzzy. She reminded me of just how great dogs are and I wouldn’t trade her for anything. It actually brought back memories of my childhood dog and how he had an effect on my childhood and young adult years. Although there are a lot of good memories of my childhood dog, the memory that kept flooding my mind was not good. Fuzzy was a half spits/half collie breed that my dad got for me when I was 5-years-old. 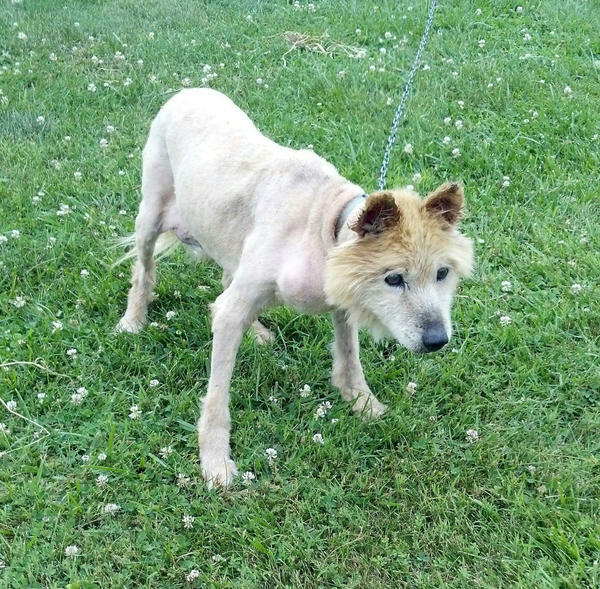 I had to put him down when I was 24-years-old and Fuzzy was 19-years-old. I am now 28-years-old and it still amazes me that he had been with me for around 80 percent of my life when I had to put him down. Nineteen years is a long time for a dog to live and he would have been 133-years-old in human years, according to the universal rule that one dog year equals seven human years. That is amazing to think about and it is still a concept that is hard for me to grasp. 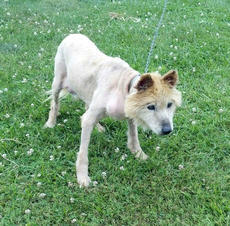 But similar to a lot of other older dogs, Fuzzy had started to develop arthritis in his hind legs. 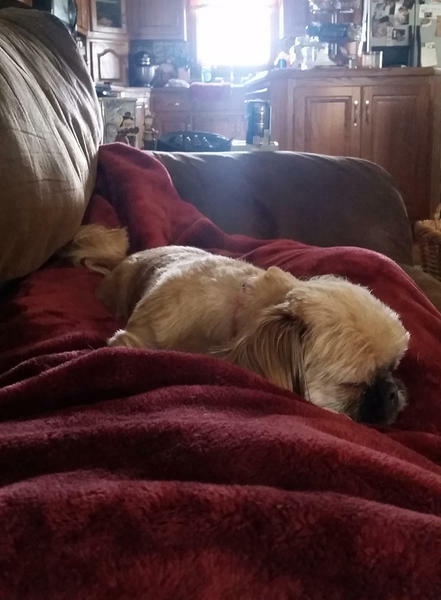 He had struggled to get up on his own for the last two years of his life but during his last few days it got to where he could no longer get up on his own anymore. When I would wake up in the morning and come home from work in the afternoon, I would have to pick him up after he had fallen and laid on the ground for hours without being able to get to his food and water. He was always exhausted and breathing heavily from spending the whole time trying to get up while I was asleep or gone. After I would pick him up and hold him upright for a few minutes, he would eventually build up the strength and start walking but it wouldn’t be long before he would fall again and he could never get back up on his own. The hardest part of the decision for me was agreeing to euthanize him even though he could still walk on his own after I would pick him up. Although he could still walk, I just simply couldn’t be with him 24/7 to pick him up every five minutes when he would fall. I had become convinced that Fuzzy wasn’t going to die on his own no matter what and he had proved that on several different occasions. There had been numerous times when I found him in bad shape “knocking on death’s door” lying on his side gurgling and breathing heavily while he was trying to get up but no matter what he would always recover until his final days. His feisty spirit was still there it was just his body was no longer able to function and keep up with his spirit. It was like dying on his own was too simple for him and I eventually came to terms with the fact that he needed to be euthanized instead of continuing to suffer during the hours that I was asleep or wasn’t at home to help him. I have always been a dog lover my whole life and believe they are the most loyal and faithful creatures on earth. I have always believed that they have many things to offer us that other animals and humans can’t. After being required to take all of those personality tests in grade school, I discovered that I always had more introvert tendencies compared to extrovert, meaning that I enjoy spending more time alone than spending more time around people. Don’t get me wrong, I enjoy spending time with friends and family but I also enjoy my alone time as well. This is where Fuzzy would always fit into my life. After a long day of being around people and out in the public, I could always come home, escape the real world and unwind with Fuzzy. Dogs are the only creatures on earth that act like they will never see you again whenever you leave home to go out or go to work. But whenever you come home at the end of the day, they are extremely excited and always act like you are just getting home from a four year military stint. The only thing Fuzzy required of me was food, water and my undivided attention. He never talked, argued, complained, or wanted me to do things for him. He just simply wanted to be around me whenever I was home. Even when I was often grumpy and tired, his opinion of me or attitude toward me never changed. In my opinion, this is the main reason dogs are called a man’s best friend. No matter what we do in life, their opinion of us never changes. All they ever want is our attention and to simply be around us whenever they can. Fuzzy fit that criteria of a man’s best friend to a tee and in a lot of ways he actually did more for me in my life than I did for him. After nineteen years and over 80 percent of my life spent with him, it’s unfortunate that everything had to come down to me having to agree to euthanize him. But it doesn’t shock me at all because he was just simply too tough to die on his own. So as I laid on the couch watching Charlie sleep, trying not to move too much so I wouldn’t wake her up, I was so thankful for her. I don’t want a time in my life when I don’t have a dog that loves me so much that they act like they will never see me again whenever I leave home to go out or go to work. But whenever I come home at the end of the day, they are extremely excited and always act like I am just getting home from a four year military stint. Nothing can take place of that feeling in our lives and I am so thankful to have Charlie to fulfill it.